I have been known to serve my food with readymade, store bought naan. But as this is Christmas. 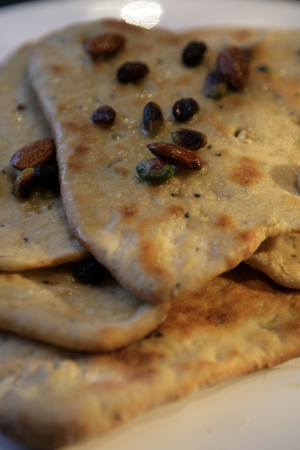 I thought I’d make an effort and trial Peshwari Naan, a soft mixed nut and raisin-filled tandoori flatbread. I cleared the kitchen surface, cancelled all appointments and got ready to prepare the feast. Just then I got a note about the evening plans. Christmas carols under the tree will now feature more than tuneless singing and too much drinking. Our host, the neighbour downstairs, has tasked his long suffering man with cooking dinner for the seven invited guests. Using a recipe from this blog. I immediately offered assistance. And Peshawari naans. But it was hard to tell who was freaking out more. The lovely new Indian cook downstairs. Or me about the potential for two recipes to fail in front of all my neighbours. PS= Recipe a big hit! Soak the almonds in warm water to help skin them later. In a large mixing bowl, sieve the plain flour. Add to this the yeast, sugar, salt and nigella seeds. Warm the milk and yogurt together for 40 seconds in the microwave or on the cooker. Add a third of the flour mixture and mix well incorporating all the ingredients. This is when it’s all sticky and awful. Keep adding the milk and yogurt until all the dry flour is incorporated into a soft and pliable dough. You want to punch the dough with your knuckles backwards and forwards for a good five minutes. This was exhausting but I kept reminding myself of the soft naan later. Next, tip the dough ball on its side, coat the bowl with the oil and place the dough back in the centre. Dampen a clean cloth with warm water, cover the bowl and leave to sit in a warm place for two hours. After two hours, take it out and give the now double and very frothy dough a few more punches and return to its warm place with the cover. An hour later, peel the almonds (or simply use skinned almonds) and roughly crush all the nuts together. Extract the dough and punch it down again. Turn the oven on to the highest setting, with the lined baking tray inside it. Tear the dough into seven even balls. Flatten each one on a floured surface, stuff with 3-4 raisins and a tablespoon of the nut mixture, then roll into about half a centimetre thick and stretch into a teardrop shape. Use as little flour as possible and shake off any excess flour because this will make the naan hard. I would recommend putting no more than two in the ovenÂ at one time. They only need three minutes on one side for brown spots to appear and fluff up. Get the next two on and brush the cooked hot naans with butter. To serve, dampen them slightly and microwave for 30 seconds each drizzled with some nuts fried in butter for a truly decadent treat. Point 4 made me laugh so much. I made regular naan once, it came out well, atleast the shape. But it had a sour taste and yeasty taste/smell. Not ventured in that process again. That looks very delicious malika…I am sure these brighten any day!..will try this out sometime! What a fantastic holiday recipe. 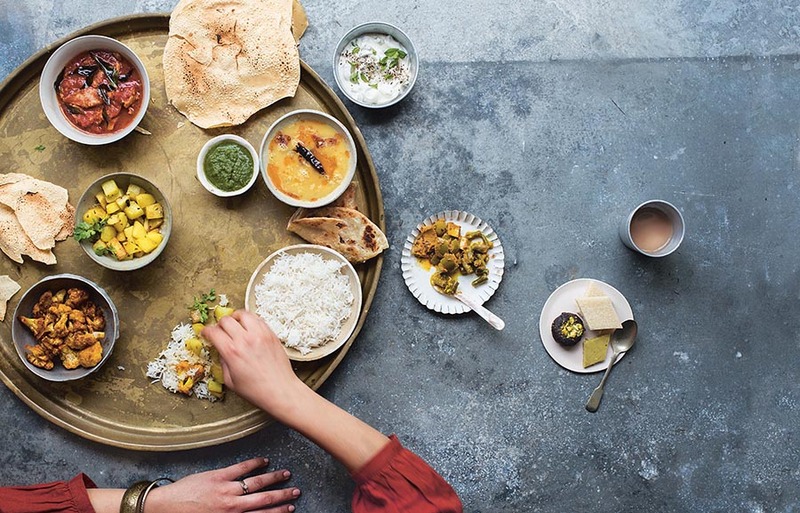 I have never had a sweet naan before, I would love to try yours, Mallika! Beautiful Naans! I dislike kneading ’cause I’m simply lazy! Will avoid my wardrobe indeed! V tempting…but I’m also tempted to skip the almond soaking/peeling bit. Can I get away with it? This sounds such a treat! Wow, what a wonderful site. I’m a first timer here and must say that everything looks very professional the recipes sound delish, the photos looks amazing and you are great! Wishing you all the best for Christmas and new year! Thanks sweetie..I’m flattered you kneaded ’cause of the tag! What a visual treat! And complete with recipe. loving the fingernail tip. you are a true goddess! been making curries all week (even new years eve) and even made our own tamarind paste and rechad spice paste (? madhur jaffery new book yum) proud? !